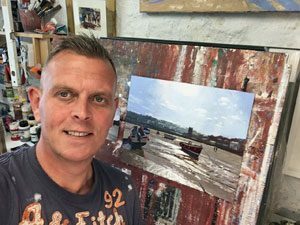 Jeremy Sanders is a Cornish based artist who brings the traditional medium of oils, masterfully into the 21st Century, utilising varying sizes of credit cards as tools to paint with. Jeremy moved from his gallery along Kings Road Arches in Brighton in January 2017 and has now relocated to the beautiful county of Cornwall. The new gallery is sited on the A30 towards Lands End in the Hamlet of Drift. As well as exhibiting his wide variety of work, from his travels to Cuba and the Mediterranean he also continues to show his work from his time living in Brighton as well as his frequent visits to London.